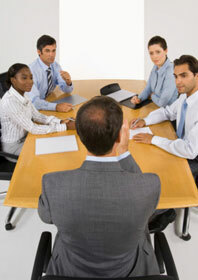 Oftentimes, a company will have prospective employees interview in groups as one of the initial steps. This allows them to see a larger group of people before scaling it back to just a few for a second interview. I went into my group interview not knowing for sure what was to follow, which is why I wanted to give you all some tips I think you’ll find helpful! It may seem like a fairly obvious tip, but it’s important to treat everyone you encounter at the office with the utmost respect. This goes for everyone—the janitor, the secretary, the interviewer, etc. People talk, and if you are rude to someone, you can bet that it will come back to bite you. The company will not want to hire someone who is unfriendly or unkind, so be aware of your disposition. Aside from the people who work for the company, it’s also important to be friendly with your competition. When I walked into my group interview, I was extremely nervous, but it was also oddly comforting to see a group of seven other nervous men and women in front of me, knowing they were in the same boat as I was. I made a conscious effort to be outgoing and friendly, asking everyone their names and where they were from. The thing was, I knew I was being observed. There were two women there who worked for the company who were “there to help us.” Read: they were there to watch our interactions. A company is looking for people who can get along with others and work as a team, so although you may not want to make friends with the enemy, it will say a lot about your character and personality if you do. Sometimes, you may have an interviewer who is very casual with you. But before you start throwing “like” or “ya know?” into every sentence, pause. Remaining formal in this situation will show the interviewer you know how to conduct yourself. Think through everything before you speak so that you don’t start sputtering out clumsy and inarticulate answers. Remember: there’s a difference between uptight and formal. Stay true to yourself and who you are, but don’t get sidetracked and end up telling your entire life story. In an interview where you’ve literally seen your competition, it’s imperative to find a way to stand out from the rest of the crowd. One good idea is to send a thank you note to each interviewer, so make sure to get business cards or at least contact information as you are going through the process. Also, arrive at the interview early. It shows that you take it seriously. Plus, you may have the opportunity to speak with some people at the company one-on-one before everyone else starts arriving. There’s nothing worse than showing up late to an interview. It looks unprofessional and it’s downright embarrassing. In my group interview, one guy showed up a full hour late! At that point, we had already started going through the interview process. He said he was “stuck in traffic,” but instead of helping his case, it just made him seem like someone who didn’t know how to prepare. Don’t let this dire mistake happen to you. If you have any helpful tips, share them in the comment section below! Kristen is a May 2011 graduate of Elon University, with a bachelor of science in English and Spanish. While at Elon, Kristen had the opportunity to complete a lot of writing and editing, two areas she has always been passionate about. At the Writing Center, she worked as a consultant with peers and community members to improve their writing skills. She also worked as an editor of Visions, an environmental magazine published by Elon faculty and students. While in college, Kristen was able to spend a semester in Seville, Spain. During the time she was there, Kristen was able to keep a blog in Spanish. She also was published in más+menos* magazine, a bilingual magazine completed by students and faculty members of CIEE Study Center. Kristen has also written for Examiner and is currently writing for Suite101. She enjoys writing as much as possible. You can circle Kristen on Google+, follow her on Twitter, or subscribe to her CollegeXpress blog.